This ring is Absolutely Stunning in person; the pictures do it no justice. 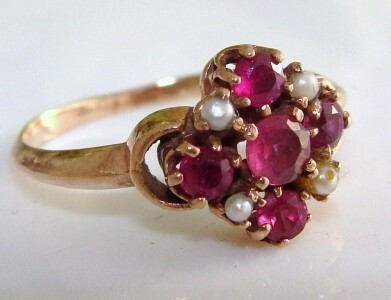 Five crimson pink rubies and genuine pearls are claw-set and arranged in a diamond shaped cluster in Rose Gold. 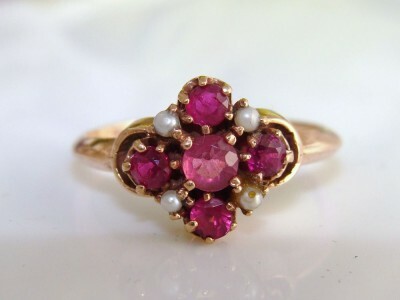 It looks lovely on with lots of sparkle and the gold has that soft pink/rose glow which makes Antique jewellery so highly sought after. Excellent Antique condition! The only detail to note is that one of the pearls has a chip to the nacre visible under magnification. It is not obvious to the naked eye at all. It is resizable, if desired – it looks great on the pinky finger.